The Plasma Rifle has been through some major changes in Minidoom2. After seeing people play MiniDoom I came to the conclusion that a weapon which was very reliable was needed, and the familiar face of the Plasma Rifle was perfect for the job. First of all the homing aspect of the rifle has been removed and taken to another weapon. The new Plasma Rifle, is a weapon which will help you in most cases, and will be a great go-to-gun. It will be an energy efficient weapon(unlike its previous version), also less destructive than before. But It will have decent DPS. Its new strengths however will not be in its firing speed or damage, but in the size and speed of the plasma projectiles. The new plasma shot is huge, and fast. You mostly won’t need to duck to reach enemies and with the projectile speed aiming will be easier. 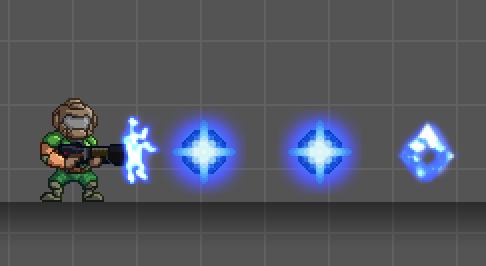 Also since the projectiles aren’t homing anymore a new mechanic to help aim has been added to this weapon. 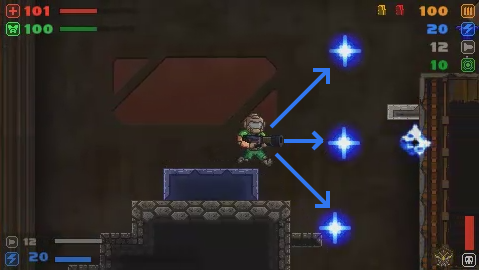 That’s right, you can aim the Plasma Rifle diagonally! This mechanic is unique to this weapon only. The weapon will also be available very early in the game! (probably right after the shotgun) So you can kill those hard to reach demons and use the energy cells you get from kills right away. The new Plasma Rifle is a weapon you can trust! See you soon space marine! Next post: The Revenant is back! What’s the red meter in the bottom right corner? So many new things, I can’t wait for November! Well, its a mechanic we are still tinkering with. There were plans in some of the Doom games to use dead enemies as a resource, the first game to do this was Doom3 with the Soul Cube. We are trying this mechanic out to reduce stress in ammo management. And since I already let it out… the next weapon spotlight will be on the Soul Cube!